A large range of lens materials, brands and designs to tailor your vision care. We recommend lenses based on what is best for your individual lifestyle and visual needs. This ensures the best balance between good visual performance and value. We do not have our lens prescribing choices dictated by a large company, based on preferred supplier agreements. We choose every model frame on our shelves. We aim to provide a wide choice of fashion, durable and timeless models. Latest technology and materials to ensure longevity. Choosing glasses for your child need not be a stressful time. 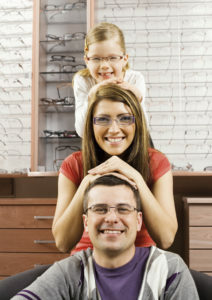 Our team are experienced in the fitting of children’s glasses and assess their eyewear needs. With over many models to choose from, we offer frames that are high fashion and durable. We know what children like! Brands include: X-Games, LaCoste, Converse, Nike, Guess, CK, Adidas, Hello Kitty (for kids) and MANY MORE! Many of our frames for children carry a Two Year Peace of Mind Warranty. Any damage to the frame is covered by a repair or replacement for 2 years from purchase (lenses aren’t covered by this warranty). sell you glasses and then give up on you if you have trouble adjusting to the prescription. You are always welcome back to see us. for frames and lenses purchased through us we will not charge you extra for the necessary cleaning materials & cases to keep your glasses in good condition. Replacement nose pads are provided free of charge for frames supplied by us.